What Makes An Employment Brand Great? You don’t need fancy perks or an unlimited budget to compete with the “cool” companies for talent. Armed with these tips and a few more advanced strategies, you can turn your LinkedIn Careers Page into a potential-employee magnet! Every single company has an Employment Brand, whether potential job seekers know it or not. There are plenty of good examples of Employment Branding that we'll go through in this post. For each one, we'll discuss what's so great about it, so you can adapt that tactic to your EB strategy. Our first example is a company most frequently known for its products' simplicity. That basic principle meshes incredibly well with being consistent with your messaging. (After all, if you try to make everything simple, it will all have the same feel.) The text on this page is broken up with images and white space. The language is concise and easy to read. The pictures have vibrant colors, so they stand out. 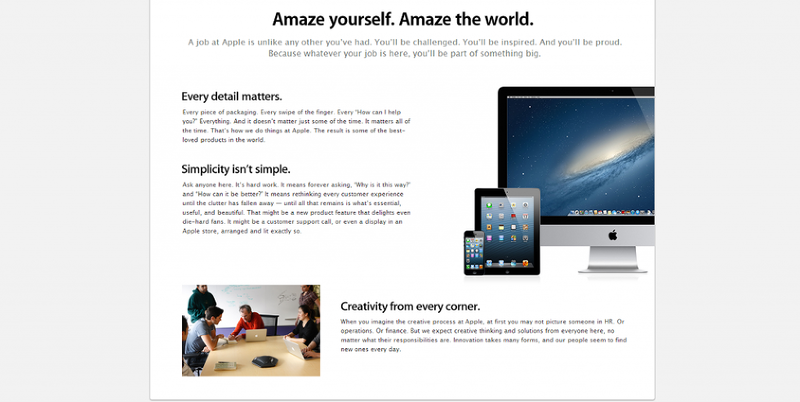 Just as importantly, every page on Apple's site has the same feel. They might not have photos in the exact same spots, or there might be more text, but you'll get a similar experience anyway. Being the marketing nerd that I am, I have a special place in my heart for HubSpot (an Inbound Marketing company). The culture code presentation below explains the beliefs of the company in a refreshing way. Instead of just listing the perks offered to each employee. The culture code shows why certain things are important to the company. It gives context for the great things HubSpot provides to its employees. 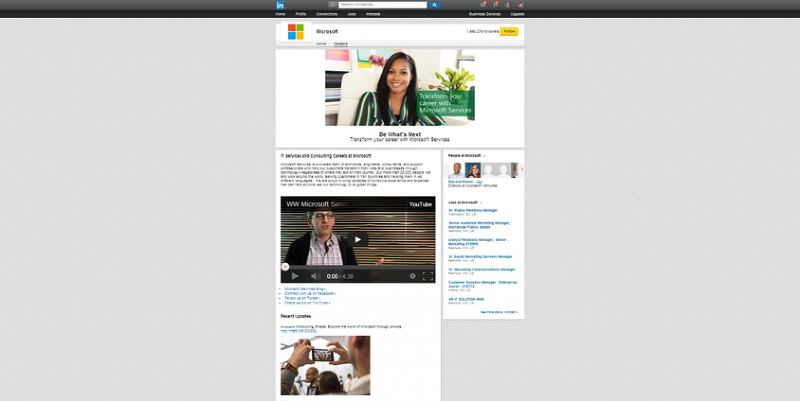 Microsoft gets a thumbs up for using various types of content on its LinkedIn Careers Page. There are two videos, and their status updates both contain images (which drastically increases the amount of engagement they get). By having all of this content on LinkedIn, the infrastructure is taken care of. There aren't any worries about coding or page layout, and it's much easier to rank well in search engines. One of the most famous customer service companies takes the cake in this category. Because Zappos' Employment Brand is all about fun, they made their video reflect that. Not everyone will enjoy the video, but the type of job seekers who appreciate Zappos' dedication to empowering its employees certainly will. They're the only people Zappos should focus on, which is exactly what they're doing. Check out our How Employment Branding Works page or our Employment Branding FAQ. Can't find the right talent? We can help!